That little girl in your life will absolutely adore this personalized baby doll- she’s a custom gift that is sure to be treasured for years to come! Sweet little babies deserve gifts just as sweet as they are, and this personalized “My First Dolly” is just right! She is soft and huggable, with a completely stuffed head, body, arms and legs – meaning no hard parts to interrupt snuggling! She comes in your choice of either blonde or brunette hair peeking out from her little pink flowered hat. She is dressed in a soft velvet-y jumper style overall dress with precious eyelet trim, plus pink leggings and a white shirt accented with cute little pink polka-dots as well as more eyelet trim around her wrists. All of her clothing is part of the doll so you don’t have to worry about this little dolly losing clothing items as time goes by! She is completely machine washable and made of soft polyester fibers, which can give you confidence to let your little one love on this personalized dolly all the time! This doll is 12 inches tall, making her a substantial size for a baby snuggler, and as your baby grows the doll will continue to be a huggable size! This little dolly is designed to be personalized with any name you choose, up to eight characters long. The embroidery will appear on the front bottom of the dolly’s dress. This ensures not only that the dolly is a perfect present for a sweet little one, but it also keeps this little dolly identified if it is ever misplaced while away from home. 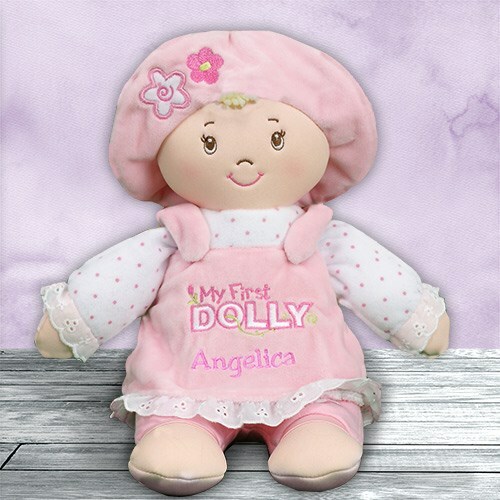 Order this special personalized baby doll for your delightful little one today!